Dimunitive slasher back Jon Vaughn (5’9″, 203) was a speedy track Michigan Wolverine product, who declared as a junior and was drafted in the 5th round by the New England Patriots. 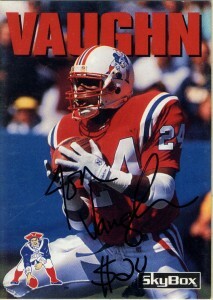 Vaughn was perhaps most dangerous in the capacity as a kick returner where he had 4 touchdowns in 103 returns. His rookie season Jon would return 34 kicks for 717 yards and a 99 yard touchdown. He’d follow up this with an impressive 1992, with 451 yards rushing and 20 kick returns for 564 yards and a 100 yard return for a touchdown. Jon’s 28.2 yard per return average would lead the NFL. In 1993, Vaughn would find himself traded to the Seattle Seahawks, where again he’d find himself in the same role, playing there through 1994. In 1994 he’d return 33 kicks for 829 yards and 2 touchdowns, virtually splitting his time with the Seahawks and Chiefs averaging 25.1 yards per return. He’d be released during training camp in 1995 and retire. Two of my favorite card sets side by side: Action Packed Rookies 1991 and SkyBox 1992. SkyBox with the giant name behind the player who bursts off the background and Action Packed with its red and gold and minimal design really make it happen. 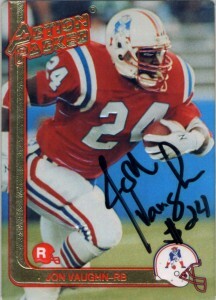 Jon Vaughn’s signature is interesting as I think it’s one of few where the player has changed the “#” to a “$”.